Tad beidzot es jums varu parādīt kādu outfit rakstu, kurā variet mani redzēt arī ārpus manām mājām :). Laiks šodien ārā bija patiešām brīnišķīgs un pat salīdzinoši silts, tāpēc pārtraukumā starp lekcijām Universitātē es pierunāju savu draugu, lai tas uztaisa pāris bildes! Man tik ļoti nepatīk viņu pierunāt tam, lai viņš bildē mani, jo viņam tik ļoti nepatīk šis process ( viņam fotogrāfēšana pavisam noteikti nav mīļākais hobijs 😀 ), bet ļoti bieži viņš ir vienīgais, kas man var izpalīdzēt! What a chic and elegant styling, love your look. The plaid scarf is so great! Dear Maddie, just the other day I 've bought the same scarf and I love it so much! Love the whole combo and that burgundy top is amazing… and such a bargain! All in all, great autumn look! I'm so sick of the summer, can't wait to wear coats again. Looking gorgeous Maddie!!! even in the university! wow!!! that scarf is so lovely!! the colors are so amazing!me want!!!!! Really an amazing coat, love it! I really like the coat and scarf! So chic- love that scarf + jacket! You look amazing! I am loving that coat so much! For someone who isn't into photography, he takes really great photos! Love the pops of red, and the deep burgundy is the perfect color for fall! Perfect fall outfit! You look so classy and modern! Yes to burgundy for the fall! I'm a little obsessed with this color this season. Also that pop of color of the red scarf, love! You must be the mostly stylish girl at Uni. 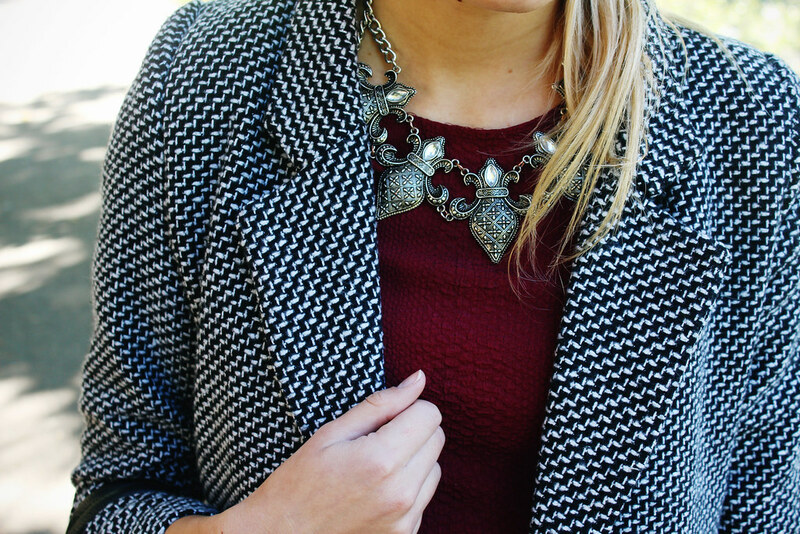 Love the tweed and the Merlot peplum, such a rich autumnal look, and the necklace is gorgeous too. It does feel special to weal heels, bit don't walk too long !! That neckpiece is so pretty Maddie! Very nice. This is really great outfit! 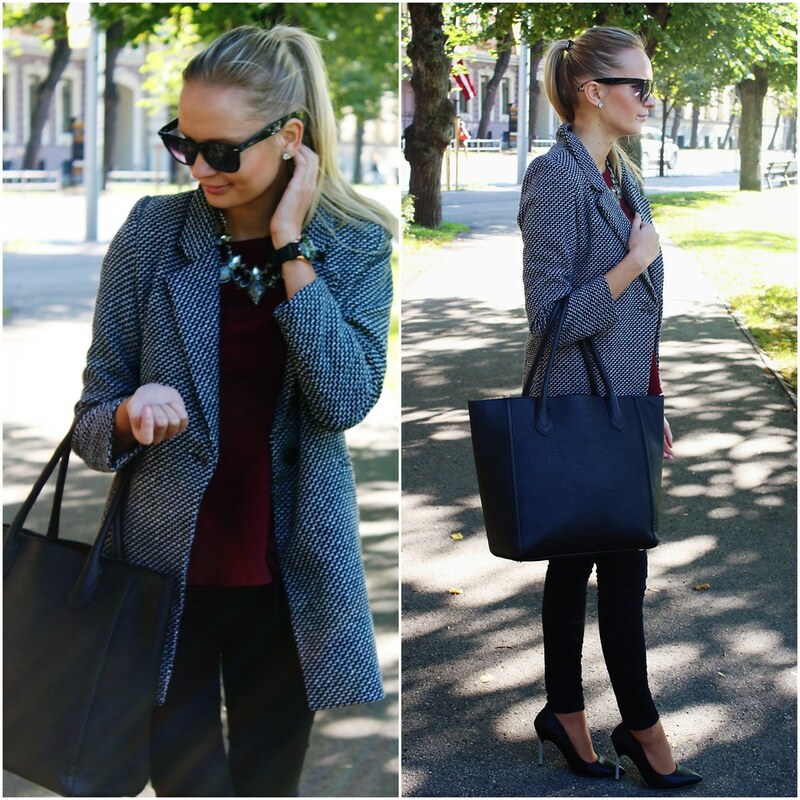 So perfect for autumn and the coat is to die for!